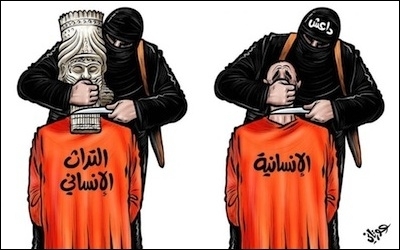 ISIS decapitates "humanity" and "human heritage" in this Arab cartoonist's rendering. Why does ISIS destroy and loot antiquities? Two explanations have been offered. This first is Islamic antipathy towards the pre-Islamic past. The second is that the group profits from selling looted antiquities. But there is a third and equally sinister reason that has barely been mentioned. Both destruction and looting comprise a system of social control over captive populations, a system that strives to regulate individual behavior down to the level of digging holes in the ground. [T]he enemies of the Islamic State, who were furious at losing a 'treasured heritage.' The mujahidīn, however, were not the least bit concerned about the feelings and sentiments of the kuffar. . . The kuffar had unearthed these statues and ruins in recent generations and attempted to portray them as part of a cultural heritage and identity that the Muslims of Iraq should embrace and be proud of. Yet this opposes the guidance of Allah and His Messenger and only serves a nationalist agenda. These pronouncements make it clear that their motives are precisely Islamic and have excellent precedent. Those who claim that these actions somehow go against Islamic tenets or history are deluded. This iconoclasm is no different from ISIS's punishments like amputation for theft or stoning women for adultery—or throwing gay men off of the roof, crucifying criminals or beheading enemies. ISIS explains this all very clearly. The goal is not simply economic profit but psychological control. But ISIS's profit motive is equally clear. Looting of sites and museums in Syria has skyrocketed since the start of the conflict. Government forces, anti-Assad rebels and Kurds are all involved, but ISIS introduced a level of organization and control that is unique. Satellite photos show neat rows of looting holes on archaeological sites in ISIS controlled territories. Documents reveal that ISIS treats antiquities as a natural resource on par with gemstones and stolen property. The same department, the Diwan al Rikaz (Department of Precious Resources), that deals with mines and minerals also handles antiquities. ISIS issues excavation licenses, takes a share of goods when they come out of the ground, taxes sales and does some amount of its own marketing, including through social media. And yet recent studies, including one that I coauthored with Yaya Fanousie for the Foundation for the Defense of Democracies, suggest that profits simply aren't that large. Far from the initial claims that ISIS was making tens of millions or more from stolen antiquities, the true figures are likely far lower. All observers agree that oil and stolen goods, including funds taken from Mosul banks, comprise the bulk of ISIS's wealth. 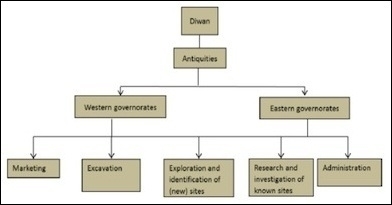 A U.S. State Department chart shows the internal structure of the antiquities department of ISIS' Diwan al-Rikaz in Deir ez-Zor governorate, Syria. Some antiquities can indeed be sold to the final buyer in Europe, the United States or Asia for vast amounts. But most of the material coming out of the ground—pottery, glassware, coins, architectural fragments—are not high tickets items and are worth, at most, only a few thousand dollars even at the final point of sale. And when they are extracted they are worth far less; most studies of looted antiquities suggest that the final sales price can be as much as 98 percent higher than what diggers in the field are paid. Of course, to the impoverished residents of Syria and northern Iraq even a few dollars have immense value. But where is the value for ISIS if the total income from antiquities is only a few million dollars, compared to, say, oil revenue, which for 2014 was estimated to be between $100 million and $263 million? The missing value of antiquities looting for ISIS lies precisely in the realm of social control. ISIS is creating a state ostensibly modeled on that of early Islam but does so with a modernist obsession with bureaucracy. It produces a stream of rules and regulations, for everything from school curricula and children's vaccination schedules. It produces chits authorizing the movement of fighters, it fixes the prices for childbirth, regulates fishing methods, bans Apple products and sets college examination schedules. And of course there is detailed religious guidance, including for schools, which operate on "Islamic State time." There are numerous taxes, including jizya for non-Muslims, and on businesses and economic transactions, and fees for water, electricity and other services. Antiquities are usually taxed at the khums rate of 20 percent. And there are massive expropriations of property—including at gunpoint—from Muslims and especially non-Muslims, everything from cars, refrigerators and apartments to the most heinous of all, slaves. A recent estimate suggests roughly half of ISIS's monthly income derives from confiscation and theft. All these feed an imperial economy that relies on the continued allegiance of fighters, now estimated to number at least 30,000. Recruiters are paid thousands of dollars for each fighter, depending on their skills. Fighters themselves receive signing bonuses, monthly salaries, child allowances, honeymoon rewards, apartments and much more, including slaves. The ISIS economy and ideology demand the continued extraction of surpluses, and more importantly, mechanisms of social control, including over antiquities. Looting antiquities has been part of the coping economy of Middle Eastern societies for centuries. Looting antiquities has been part of the coping economy of Middle Eastern societies for centuries. Digging up antiquities from archeological sites, and even using their organic rich soil as agricultural fertilizer, is a traditional source of extra money for Middle Eastern populations. By controlling antiquities like other resources ISIS inserts itself into countless holes in the ground. It taxes countless antiquities transactions along the supply chain and controls the movement of the loot, guiding and directing what had been a traditional economic activity. The real goal is not simply economic profit but psychological control over new ranges of behavior and thought. Making the central government the absolute source of both rewards and punishments was a fundamental part of ancient Mesopotamia, where thugs and their religious henchmen transformed themselves from organized criminals into kings and priests. Similar problems of paying fighters with loot helped drive the imperial expansion of the Umayyad caliphate. ISIS's plunder of ethnic minorities in particular is also reminiscent of Nazi treatment of Jews and their property. ISIS's checkpoints, surveillance and inspection visits, public humiliations and punishments of criminals and others, like breastfeeding women who run afoul of its draconian ways, are parts of a totalitarian vision of absolute control. ISIS has transformed the pre-Islamic past of Syria and Iraq into a forbidden zone, a mere natural resource to be exploited. But while the financial profits may be relatively small, it also offers ISIS yet another way to control the behavior and thoughts of its population, transforming them from captives into dependents of what strives to be an all-powerful, divinely mandated state.